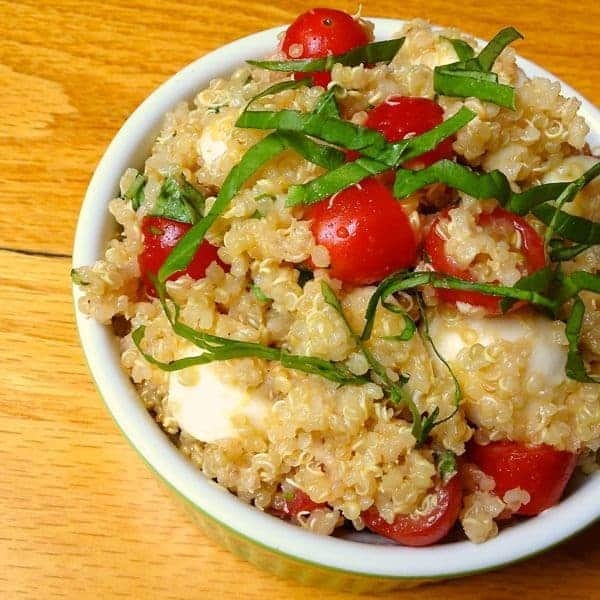 Quinoa is tossed with sun-dried tomatoes, apples and scallions in a garlicky lemon vinaigrette to create this simple, protein-packed dish. I love quinoa because it is an affordable, plant-based source of protein that is naturally gluten free and full of fiber. That being said, until recently, I thought I hated it! As it turns out, I just didn’t know how to prepare it properly. The truth is, quinoa is extremely versatile. It is a blank canvas that can be used in soups, salads, stir-fries, desserts and more. 2. Season Properly: Salt is your friend when it comes to cooking quinoa. Or any food from scratch for that matter. Remember, no matter how much salt you add when cooking at home you are always going to wind up with less sodium than anything you order in a restaurant or make from a box. 3. Add Texture: Quinoa can be a bit mushy on it’s own. I love combining it with various ingredients to add contrasting textures. Crunchy apples, chewy sun-dried tomatoes and fresh herbs all add texture to this dish. 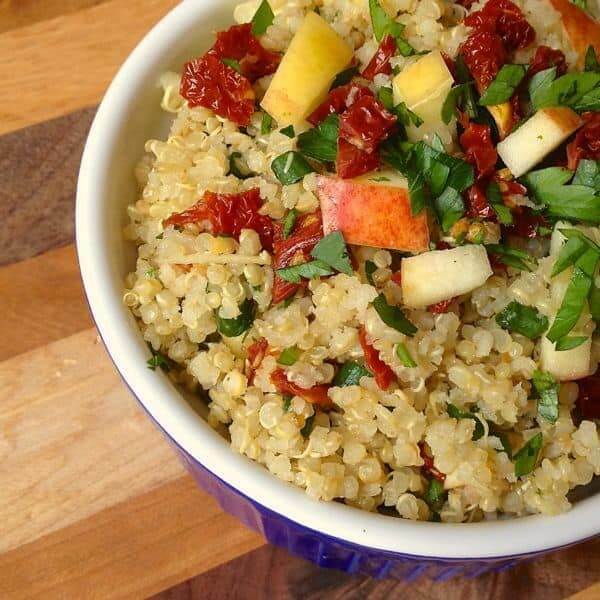 In a medium bowl, toss together cooked quinoa with diced apples, sun-dried tomatoes, scallions and parsley. In a small bowl, whisk together olive oil, lemon juice, grated garlic, salt and pepper. Drizzle vinaigrette over the quinoa mixture and toss well to combine. 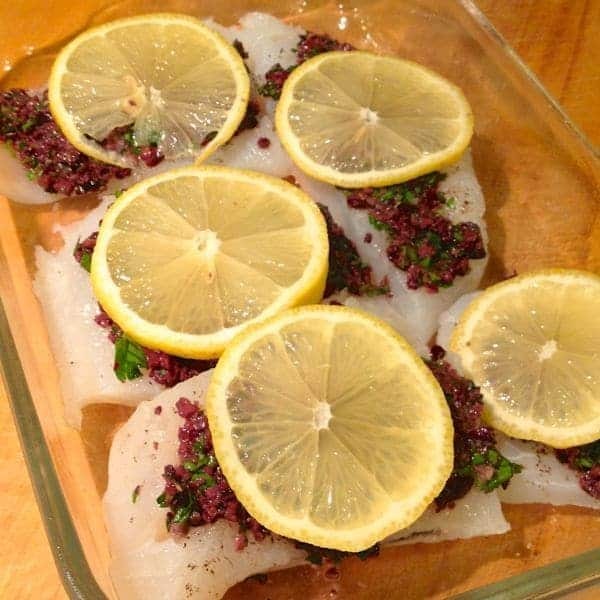 Serve immediately or store in an air-tight container in the refrigerator for up to 5 days. Yummmmmm! I know these flavors would be a hit here, can’t wait to make this! Wow love that combination! 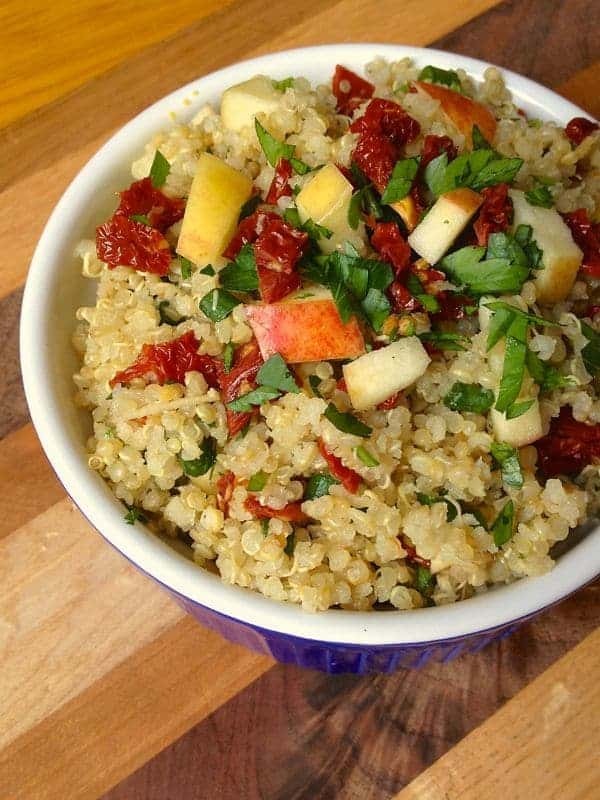 I am addicted to quinoa, I love the tang of sun dried tomatoes….and with apples too! Yum yum yum! You know how to work your flavors! This is wonderful! Pinning right now! Let me know what you think – you would love this Tina! Ooooops I left my comment in the wrong place! Eeek! But I love the tips you give too, the first time I made qunoa it was mushy and tasteless! Those are all GREAT ideas! Interesting combo! Love your secret tip for cooking quinoa. So for the link you have listed below for the Quinoa Granola, have you tried rinsing & toasting before baking or do you just leave the quinoa uncooked as it says to? I’m confused. But really want to add quinoa into my diet & I eat homemade granola everyday. The Quinoa Granola is not my recipe, Sarah – that comes from Ali at the incredible blog GimmeSomeOven.com – check it out!! encountered this term used this way. more like an economic growing pain. I have to say oh my gosh, this looks just amazing!!! I love all of the flavors you have going on here! Beautiful salad! It was so good Jennifer! And so easy! Great with any grain of course. I always, always, always rinse, but never tried toasting before-thanks for the tip, and for the delicious quinoa salad too! It really does make a difference!! Thanks friend! I love quinoa! It’s one of my favorite ingredients to cook with. It’s so so versitile! Love this recipe! Thank you Ashley! This is perfect for leftovers! Quinoa is my favorite because it is so versatile! Love your tips, so smart. I totally agree! Thanks Gaby! Hi Liz! 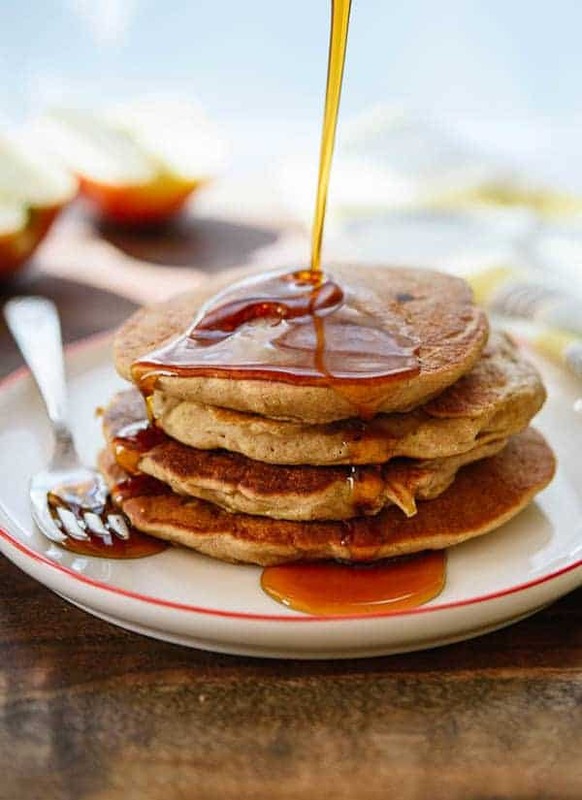 Fellow Michigan-based food blogger (and lemon lover) just stopping by to say hello :) Great post – I was always sort of “meh” about quinoa until I learned to rinse and toast it. It really does make such a huge difference. So worth the extra effort. Hi Lori!! Great to “meet” you!! Thanks for saying hi!! This looks so refreshing, Liz! My body says gimme after my weekend of gluttony! What an interesting mix of flavors here. Love the creativity! Agree with everything you said about quinoa! Love the idea of apple + sundried tomato. I never would have put those two together, but it sounds fabu! Not sure where I came up with the idea but it totally worked! Thanks Jenny!! It’s the perfect lunch to use up leftover quinoa! The key to quinoa is definitely the rinsing!! and mixing it with delicious ingredients like this. This is my kind of lunch salad! Yes!! Why did it take me so long to learn that?! Love your tip on toasting quinoa, I actually haven’t tried that! I am really trying to learn to LOVE quinoa, so maybe that will help! 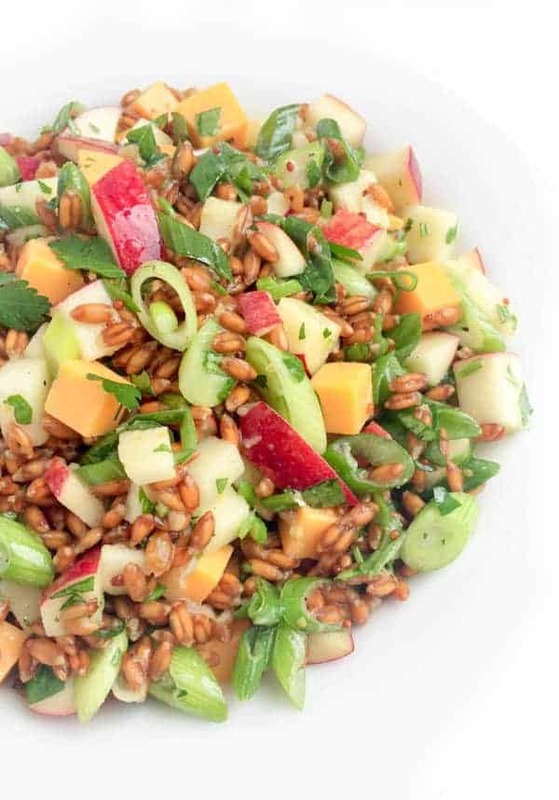 The combo on sundried tomatoes, apples and scallions sounds fab here Liz! Love this one!